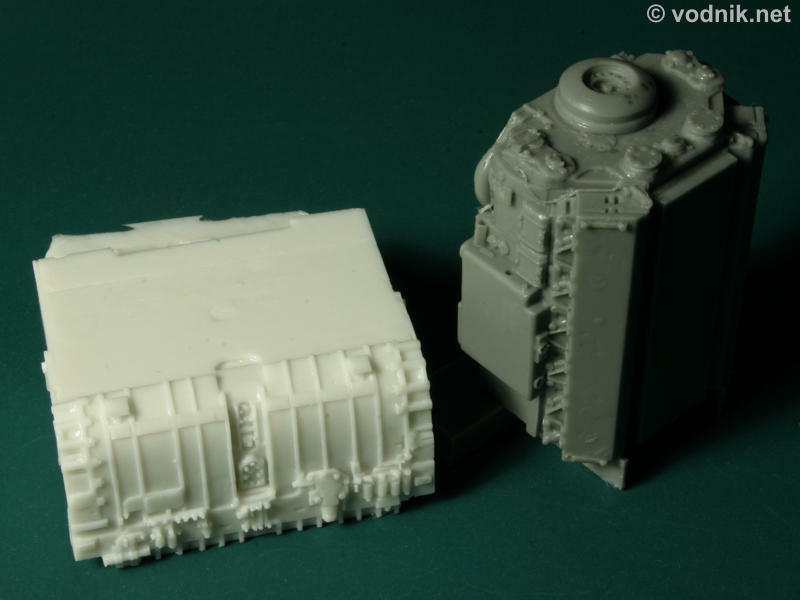 Perfect Scale Modellbau are a new modeling company and their first product is, quite adequately for a German manufacturer, a resin engine set for modern German Leopard 2 tank in 1/35 scale. 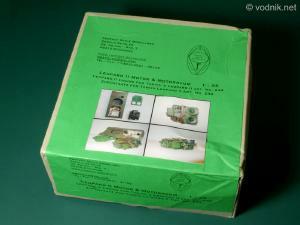 The set is designed for Tamiya Leopard 2A5 and Leopard 2A6 kits. 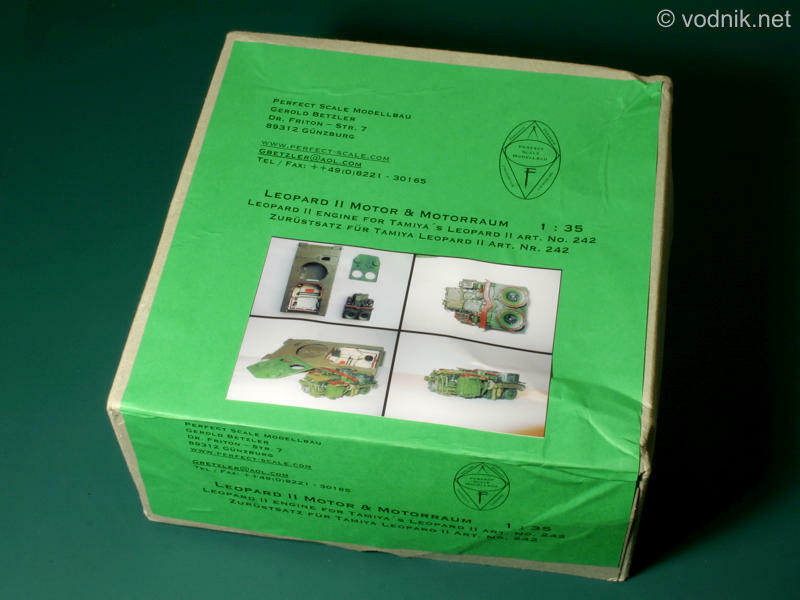 On the box lid label only Tamiya Leopard 2A5 kit (35242) is listed, but in instructions both Tamiya models are mentioned and it is quite obvious as both tanks have exactly the same hulls and engines, both in real world and in model form. The set comes in quite large cardboard box - 22 cm x 22 cm x 10 cm (8.7" x 8.7" x 4"). On the box lid is a green label with set description and attached to it is a color photo print with four pictures of completed set. Inside the box are seven plastic zip-bags with resin parts and metal wires inside, protected by the bubble wrap. These bags do not fill the whole box - the bottom of it is covered with protective plastic "air-bags". 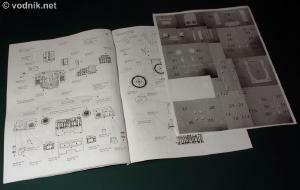 We also get instructions printed on both sides of seven stapled together A4 size sheets plus one sheet with parts index in form of black & white photos (poor quality, but enough to recognize parts) with numbers next to them. On the index sheet there were small green checkmarks made with a marker next to each part number - it looks like a proof of quality check performed on the set to verify its completeness. There is also a quality control certificate included in instructions with a signature of person performing the check. If you order your set directly from Perfect Scale Modellbau, you will find one little surprise in the box - a candy bar! :-) Nice touch and guaranteed way to put a smile on customer's face. The set includes complete powerpack i.e. engine and transmission plus engine compartment with walls and all devices installed in it. Engine deck cover is also included. The set includes parts which allow you display the engine separately from the tank, or installed in the engine compartment, although you cannot have it both ways and make it removable - you need to choose one option. If there is anything missing from Perfect Scale set, I would say that it is a sling. 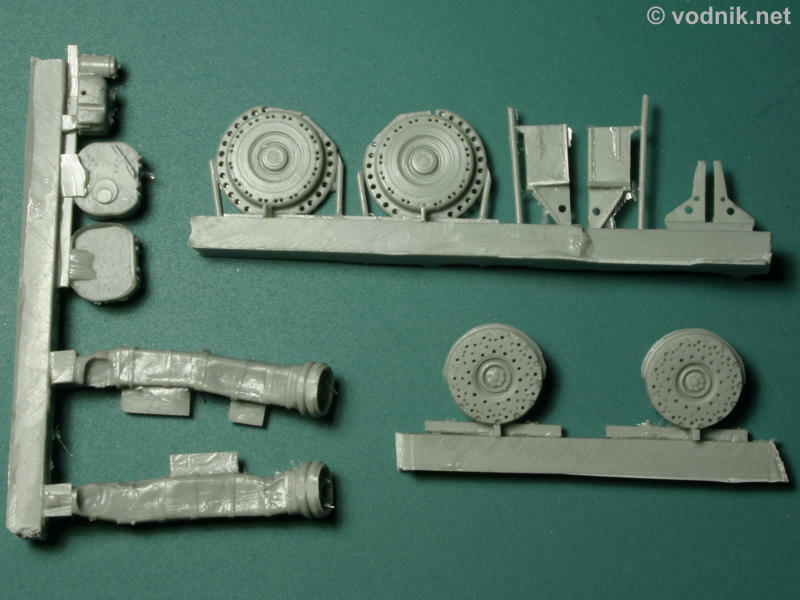 If you plan to use the set in a diorama with the engine being removed from the Leopard by recovery tank, you need to scratch build the sling yourself. This is a really big box. Microscale Micro Sol is of course not a part of the set, but I put it next to the box on this photo to show you its size. Instructions and parts index card. In plastic zip-bags we should get 123 resin parts. I set we should, as I actually got more, as two copies of one of larger parts were present in my set, one probably included by mistake. Interestingly, these two parts in my set were not identical, as one was molded in light cream resin and the other in gray resin and the way they were attached to resin pouring blocks differ slightly, suggesting that they came from different molds. In addition to resin parts we also get three lengths of metal wires: 0.2 mm aluminum wire, 0.3 mm copper wire and 0.8 mm aluminum (?) wire. The last one is rather stiff and in instructions it is referenced to as "1 mm" wire, so I will probably replace it with 1 mm solder wire, which is much easier to work with. 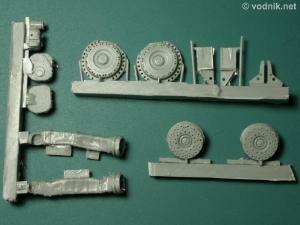 Most parts in the set were molded in gray resin, some in light cream resin. 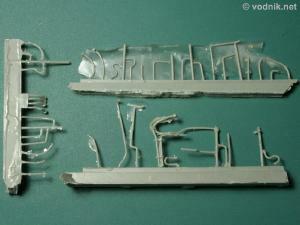 There are also a few parts molded in flexible "vinyl like" resin. I'm not sure exactly why this kind of resin was used, but the reason may be that these parts are quite big and thin, so they would be very fragile if molded in regular resin. They will also be attached flat to plastic hull parts, so their flexibility won't matter at all. 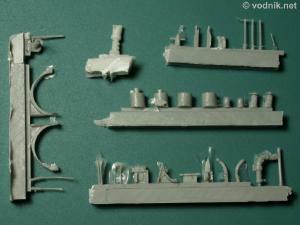 A few of included parts are relatively big blocks of resin with nice and crisp details molded on them. Two such parts make up main engine and transmission block and other two big circular parts represent air intake filters with extremely delicate fan blades molded on them. To my Mark 1 Eyeball measurement device it looks like those air filters are slightly oval and not perfectly circular - unfortunately it is a problem that quite often plagues such resin parts (like resin wheels). It is just a minimal deformation, which can be just ignored and I think that a short bath in boiling water should make resin soft enough to make slight correction of the shape possible, if someone feels it's necessary. 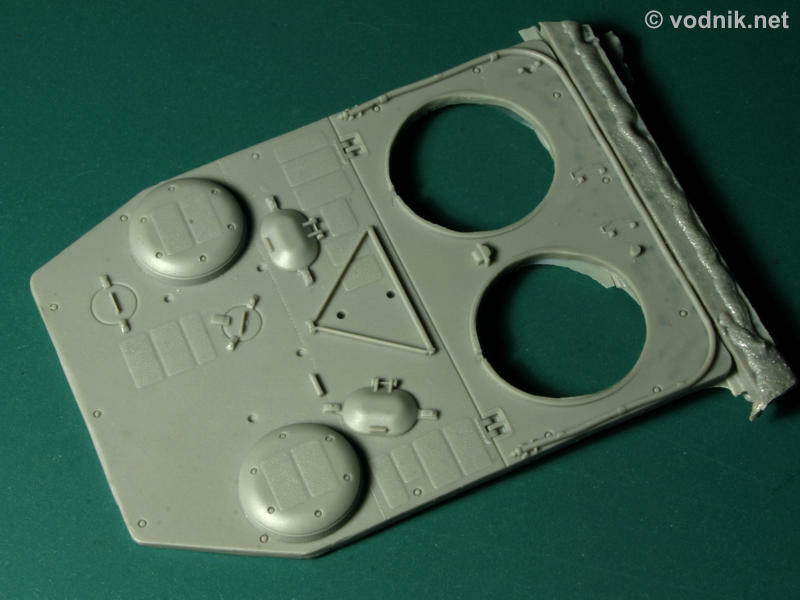 One of the largest parts in the set is the top engine deck cover. 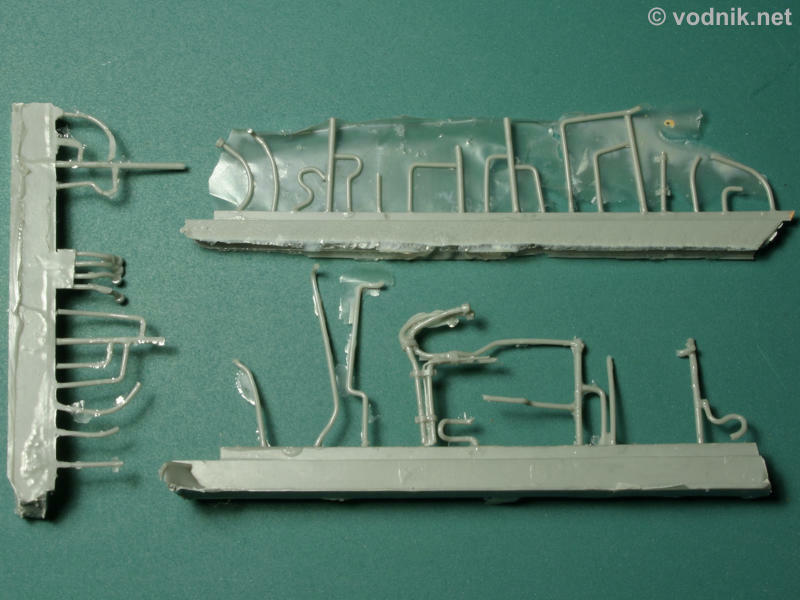 It seems to be a resin copy of the engine deck cut from the Tamiya hull part. The resin part is warped a bit, but hot water should again make it possible to fix it. 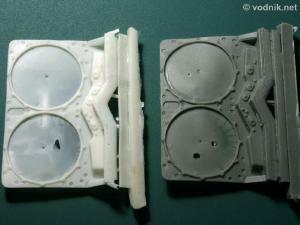 The whole engine deck cover is molded as one part and it is almost 2 mm thick. 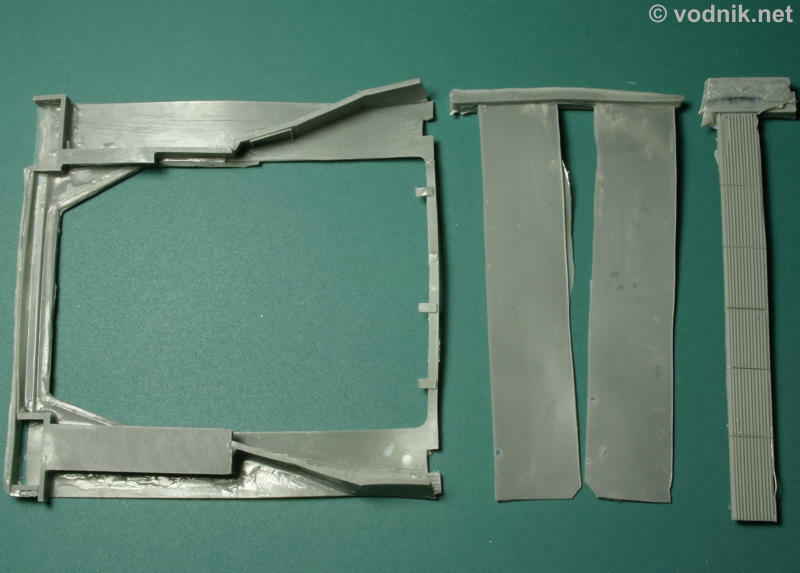 This means that it is much too thick - in reality it is relatively thin armor plate and in 1/35 scale it probably should not be thicker than 0.3 mm. I would prefer to have the cover in two pieces, as in reality it is hinged in the middle and front part can be raised to provide access to the engine underneath, while the back part over air filters remains in place. It is possible to cut the resin part along the hinge line, but its thickness and the lack of any details on the bottom of the cover make it pointless. 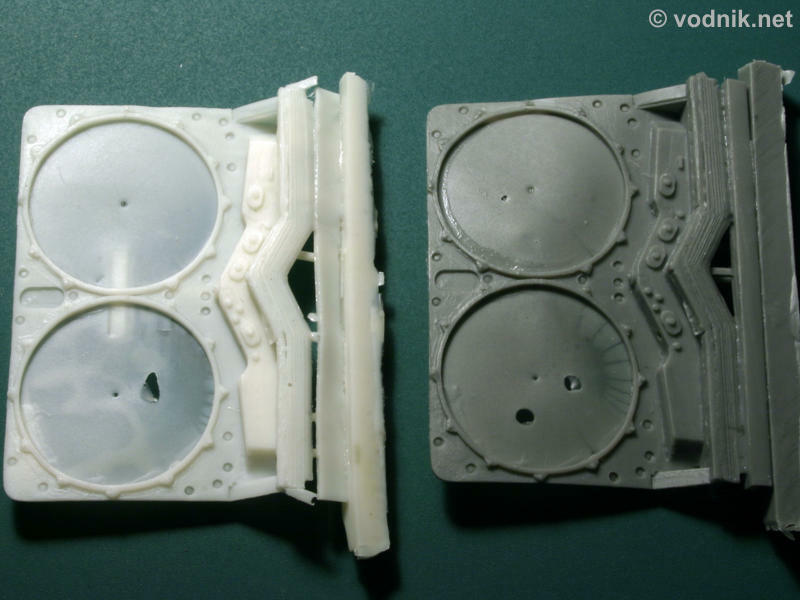 If you just plan to put the complete engine cover next to the model on a diorama, you need to thin at least its edges to make it less obvious how thick the part is. For some reason, maybe by mistake, two copies of this part were included in my set. One molded in light cream resin, the other in gray one. Two large resin parts with very nice details on them make up main engine and transmission components. Large air intake filters. Note fan blade details. Click on pictures to enlarge. 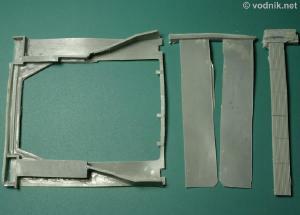 The large part on the left and two rectangles are molded in flexible resin. 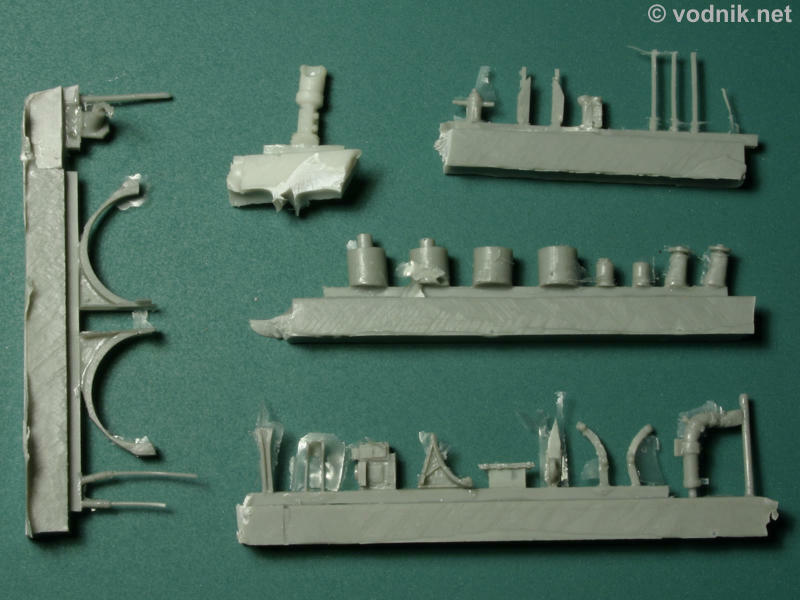 There is a lot of parts included in the set and it is impossible to describe each and every one ot them. Some (but not all!) are shown on photos below. You may notice that there is quite a lot of flash on some parts, but it should be easy to remove in most cases. Only for some of the pipework provided as resin parts it may be tricky process to clean them up and I personally plan to use copper or solder wires instead, using resin parts as templates. 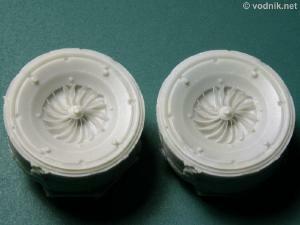 Engine compartment cover is a copy of a section of upper hull part from Tamiya kit. Note realistically sculpted exhaust ducts. There is quite a lot of flash on these parts. Resin used to mold parts in the set is not particularly hard and removal of resin pouring blocks should be relatively simple. A few smaller parts actually separated from their blocks by themselves in my set, but they were not damaged in any way. A number of parts in my set were warped, some quite seriously, and an attempt to straighten them will need to be made before they can be used. Luckily air bubbles appeared on just a few parts and should be easy to fill. It is difficult to assess the accuracy of the set in its unassembled form, but comparison of pictures of completed engine on the box lid and Perfect Scale Modellbau website to photos of real Leopard 2 powerpack does not reveal any noticeable discrepancies. The first Perfect Scale Modellbau product is really impressive. Amount of small details, both molded on larger parts and provided as separate pieces assures that once completed, the set will look great and very realistic. It is not cheap at €58.00 ($72.50), but seems to be worth its price. 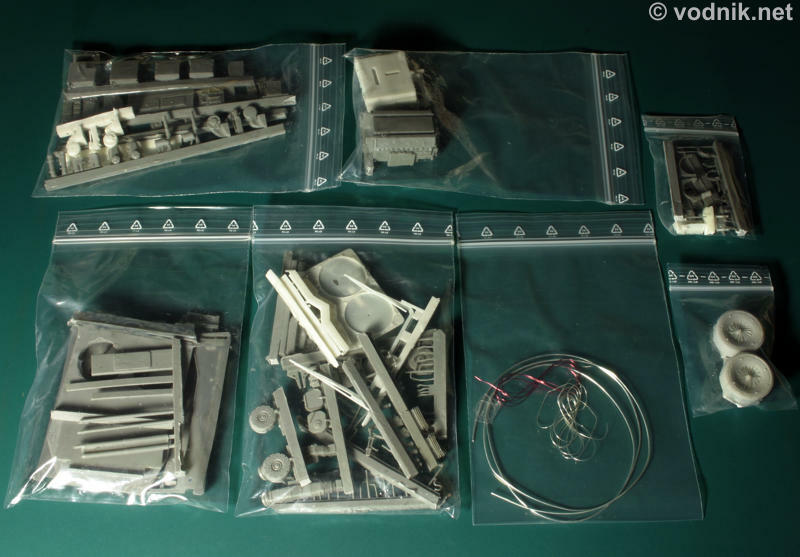 Because of quite extensive preparations of both plastic parts from the kit and resin parts from this set needed, the large number of parts included and not quite clear instructions I cannot recommend this set to less seasoned modelers. But those who already have some experience with big resin conversions should find this set a real treat. It is not without its flaws, but it has a potential to turn already very good Tamiya Leopard 2 model into a centerpiece of any modelers collection! 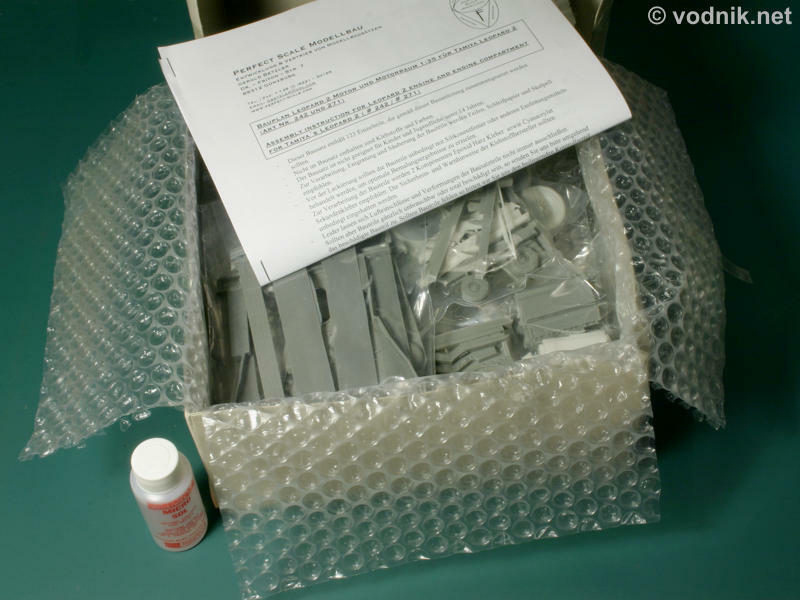 Many thanks to Gerold Betzler of Perfect Scale Modellbau for the review sample! 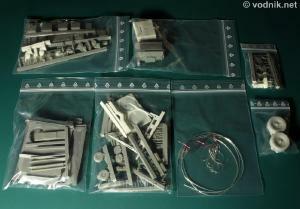 Perfect Scale Modellbau products are available directly from their website: Perfect Scale Modellbau.